Boundaries. We all have them, whether they be physical, emotional, mental, financial, professional, and/or social. They are the limits or guidelines that we set for ourselves and others for the way we want to be touched or in regards to our personal space, how we act and express ourselves, how we think and feel, our opinions and how we voice them, how we want to be treated, what we can afford to spend, and how much time we can give to others. Yet often times we struggle with knowing where the line lies, getting others to respect them, sticking to them ourselves, when our boundaries are being broached upon or pushed, or even creating or implementing them in the first place. It is often a difficult and challenging process to know what your boundaries are and where they lie, how to express and maintain them effectively, and how to get others to acknowledge and accept them as well. Typically, we become aware of our boundaries when the “unknown” or unconscious line is crossed, we feel taken advantage of, walked all over, or disrespected in some way, or we reach a tipping point and have a “blow up” or “breakdown.” When our boundaries have been violated or we do not stick to them ourselves, it can cause feelings of anger, sadness, resentment, regret, disappointment, and/or anxiety, to name a few. It is much better for ourselves, and others, to become aware of where our boundaries lie, initiate and enforce them, and prevent negative situations or feelings from happening in the future. Determine what your boundaries are. This can be a difficult or confusing process if you haven’t yet determined your own boundaries through trial and error or personal experience. It takes a significant amount of personal reflection, self-assessment, and understanding to be able to identify where your boundaries are for your, with other people, and in multiple situations and conditions. It can be helpful to seek out the assistance of a therapist to discuss scenarios, outcomes, emotions, etc., to help in determining boundaries. Learn to say no. Once you know where your boundaries lie, you need to be able and feel comfortable in saying no to anything that crosses them or makes you feel uncomfortable. It can be difficult the first few times to have to turn someone or something down, but in time you will come to realize that it is actually much easier than you thought, will help you to maintain positive relationships, and will help you to feel more self-assured and confident. Knowing what you do and do not want, expressing it, and sticking up for yourself and your boundaries can be very empowering. It can help to take out a certain aspect of the uncertainty in how you interact with others, possible outcomes of scenarios or events, and what you might say or do, only allowing you to be more present and enjoy the moment. Be consistent but flexible. In order for others to know and respect your boundaries, you need to be consistent in expressing them. If you are going back and forth, saying one thing but doing another, or not being true to yourself, it will be difficult for others to know where you stand and might cause others to push your boundaries to see where they truly are. But at the same time, boundaries are not black and white or one size fits all. You need to understand that your boundaries might need to be slightly flexible based on the people involved, the situation or circumstances, and your own thoughts and feelings, but in the end they should still be reflective of your core values, beliefs, and authentic to and representative of who you are. 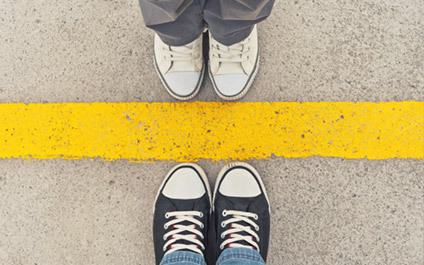 Boundaries are an important tool that everyone needs to establish and maintain. They are very beneficial to ourselves and the people in our lives. If you feel you are struggling with knowing your own boundaries, initiating or sticking to them, or getting others to respect and accept them, please contact Symmetry Counseling today to schedule an appointment with a therapist who can help you through the process.